The board further recommended that the new arm be “precisely similar” to the model then in production and that the new musket should be fabricated with as little additional new machinery, fixtures and parts as possible. 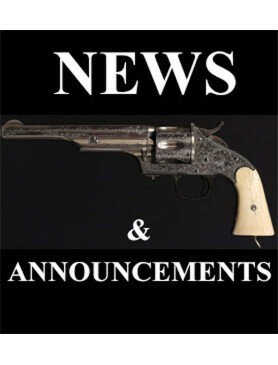 Since the Board offered the opportunity to utilize the standard M1855 lock, the National Armory at Springfield designed a rifle-musket with the appropriately shorter barrel (2” shorter than the standard M1855) and an overall length of 53” instead of the standard Rifle Musket overall length of 56”. 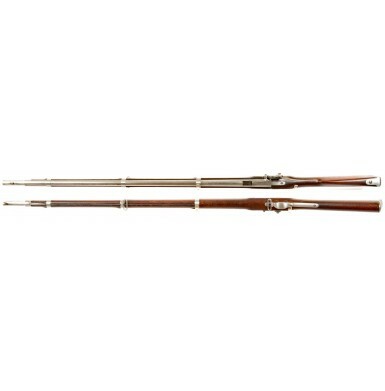 Both the cadet variant and the standard version of the M1855 Rifle Musket are completely identical in dimensions between the front edge of the comb of the stock and the rear barrel band. The buttstock is 1” shorter on the cadet musket, and the barrel is 2” shorter. The barrel band spacing is also proportionally adjusted for the shorter overall barrel length. In fact, Captain Benton noted that “All parts of the new arm should be precisely similar to those of the new Service Rifle-Musket”. 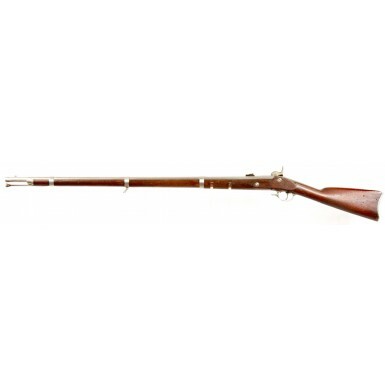 The board also recommended issuing the 40 grain cartridge for the M1855 Pistol Carbine for use by the Cadets when they were issued the Cadet Rifle Musket. 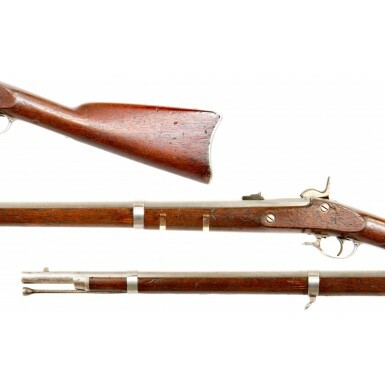 Research by George Moller indicates that the pattern musket was manufactured prior to June 30, 1858, and that is was officially adopted prior to August 19 of that year. 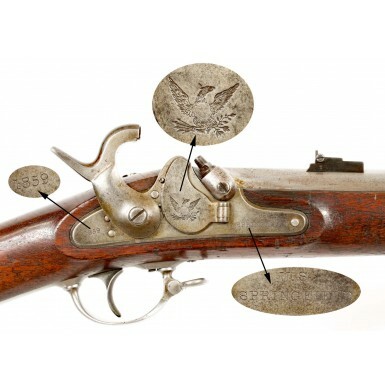 It is well documented that 2,501 of the muskets were produced at Springfield, with the “1” musket being the pattern gun. It appears the production was divided into three groups, with 1,500 produced during the last quarter of 1858, another 1,000 produced during the 2ndquarter of 1860. The anomaly is that there is a report that 500 were produced during fiscal year 1866 (July 1, 1865-June 30, 1866) (Moller Volume III, page 282). This would suggest that either 3,001 of the guns were manufactured or that only 1,000 were manufactured in 1858. 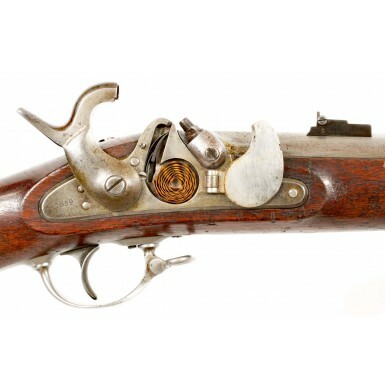 The muskets were produced in 2 “variants” or “types”, with the guns produced during 1858 having long-base, long range M1855 pattern rear sights and brass nose caps (Type I) and the later production guns having the M1858 pattern short base rear sight and iron nose cap (Type II). 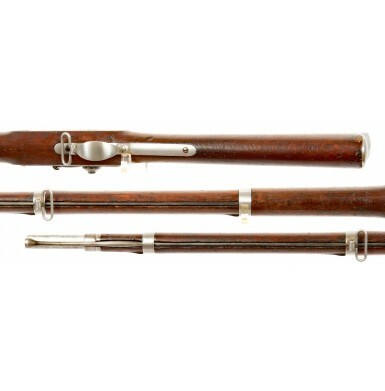 Although not widely known, 30 of the M1858 Cadet Muskets were issued to the US Military Academy at West Point, and 246 were issued to the US Navy. These were delivered to the Bureau of Ordnance & Hydrography and were requested by Captain (later Admiral) James H. Dahlgren of “Plymouth Rifle” and “Dahlgren Bowie-Bayonet” fame. According to Moller, additional M1858 Cadet Rifle Muskets were issued to the states of Illinois, Kentucky, Georgia, Maine, New Jersey, South Carolina and Tennessee prior to the outbreak of the Civil War, although the numbers issued to each state are not provided. The total issued to the states, however, was 1,624. When combined with the 30 sent to West Point and the 246 that ended up with the Navy, that leaves 600 of the known “2500” production guns, so it is possible that the fiscal year 1866 reference to 500 guns might really be a note of how many were IN stores, not DELIVERED into stores. 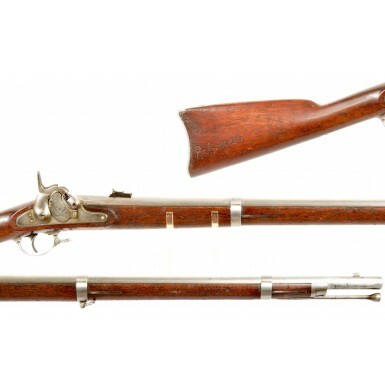 As these muskets were .58 and could fire the standard issue .58 ammunition used with the Model 1855 and Model 1861/63/64 rifle muskets, it is quite likely that those Model 1858 Cadet Rifle Muskets that were issued prior to the Civil War saw service during the war, along with their full sized brethren. 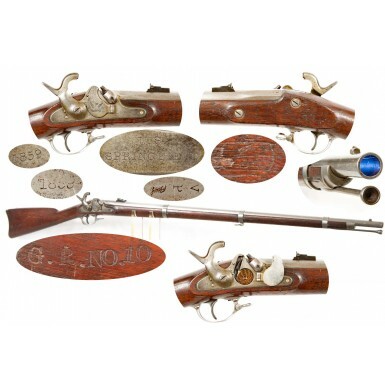 The US Model 1858 CadetRifle Musket offered here is in NEAR FINE overall condition. The gun is a “Type II” variant, manufactured during 1860 utilizing 1859 dated parts. The gun has the appropriate M1858 short base, 3-leaf rear sight and the iron nose cap. The gun has a medium pewter gray patina with scattered surface oxidation and discoloration. The barrel shows some light pitting at the breech and some scattered light pinpricking along its entire length. 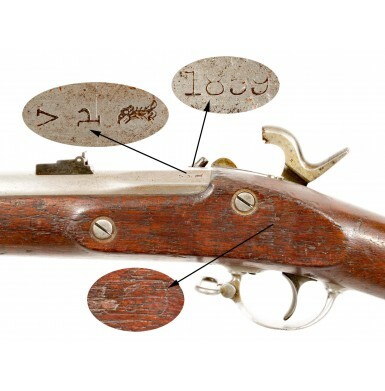 The breech is marked with legible US proof marks, including the typical V / P / (Eagle Head). The top of the breech has a mostly legible 1859 production date that is likely weak due to a very old cleaning. The lock is clearly marked with the typical Spread-Winged Eagle on the tape primer door and with the date 1859 horizontally behind the hammer. Forward of the tape primer door, the gun is clearly marked in two horizontal lines: U.S. / SPRINGFIELD. The Maynard tape priming mechanism in the lock is complete and fully functional and a partial roll of primers is present in the magazine. The lock remains crisp and mechanically excellent, functioning perfectly on all positions. The lock has a mottled gray and brown patina that is slightly darker than the barrel and other iron furniture on the gun. The specially downsized iron buttplate is marked with the typical US on the tang. 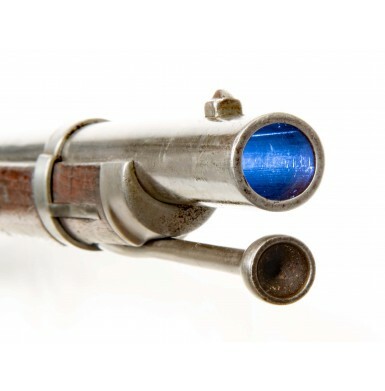 The rifle-musket retains the correct and original M1858 pattern rear sight, as well as the original front-sight/bayonet lug. The original full-length ramrod is in place in the channel under the barrel and is the correct length with a threaded end and swelled shank with a tulip shaped head. Both original sling swivels are in place as well, on both the front bow of the trigger guard and on the middle barrel band. 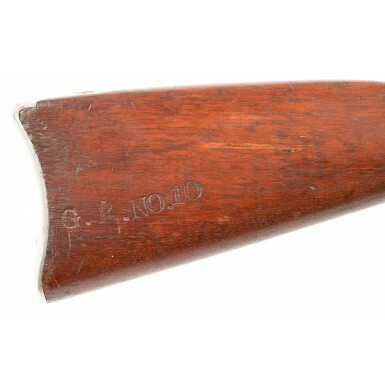 The small furniture of these rifles was blued during production. The rear sight retains most of that original blued finish with the barrel band springs and some of the screws retaining some traces of their original blued finish, with the usual fading and loss of finish due to use and age. The bore of the gun is in NEAR FINE condition. The bore is mostly bright with crisp rifling throughout. There is some lightly scattered pinpricking and very minor pitting present along the length of the bore. The stock remains in NEAR FINE condition as well. It retains strong, well-defined edges and lines, with no sign of having been sanded. Any rounding or softening of the edges appears to be from real world use and carry, not sanding or abuse. 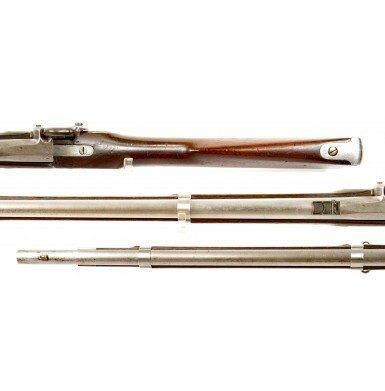 The stock is full length, with the correct dimensions for a M1858 Cadet Rifle Musket, and with the correct iron nose cap. The stock is free of any breaks, cracks or repairs. It does show numerous bumps, dings, bruises and scuffs from issue and use, but it shows no abuse. The flat opposite the lock retains a legible script JScartouche, the acceptance mark of long-time Springfield Armory employee James Stillman, who also served as an inspector for some dozen years during the pre-Civil War period. The rack number G.R. NO. 10 is deeply stamped into the obverse buttstock, in 3/8” tall characters. The meaning of the mark is not immediately clear but was likely applied by the military school where the gun was issued. The gun is accompanied by a shorted US M1855 pattern .58 socket bayonet. The blade has been professionally shortened from 18” to 14.5”, in a manner similar to the US M1835 socket bayonets that were shortened for use on the M1847 musketoons that were altered for use as ersatz cadet muskets after the supply of M1851 Cadet Muskets was exhausted. The bayonet is clearly stamped USon the face of the blade at the ricasso and is rack numbered 43 on the top of the socket. The bayonet has a medium pewter patina with scattered patches of oxidation and age discoloration. The bayonet is not an actual US M1858 Cadet Bayonet, but a shortened M1855 that displays well with the gun. 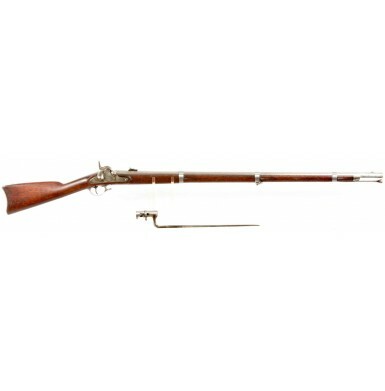 Overall this is a really very nice looking, completely correct, untouched and original example of the very rare US Model 1858 Cadet Rifle Musket. Other than the very scarce Model 1855 percussion carbine (only 1,020 manufactured), the Model 1858 is the scarcest member of the US M1855 family of arms. These guns are not often encountered on the market, and when they are found for sale, they usually show heavy use, providing further proof that saw service during the opening days of the Civil War. This is a very attractive example that is 100% correct and original and would be a fantastic addition to an advanced collection of 19thcentury US martial long arms. Even Flayderman’s Guide to Antique American Arms notes that this gun is “very scarce”, and those are not words that Norm tossed around lightly. If you have wanted to acquire a very nice example of this rare gun for your collection, this is one of those no excuses examples that I am sure you will be very happy with.